Assuming the apartment that we are going to rent is within walking distance of Paddington Train Station and we are arriving at terminal 4 we have 3 choices. £16.60 for the family at peak price - under £10 each way at off-peak. For me this time is worth the savings, but will be a hassle for luggage. The transfer would be at Earls Court and can be done "Step free." If you choose the tube you would arrive in Earls Court on platform 5, eastbound. 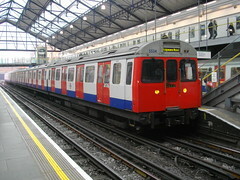 Then you would head up, nearly to ground level, to the district line train labeled Edgware Road, platform 1. This is the kicker with the tube, you get to do this with all of your bags - are your kids up to this? For my family, I think so - but I also would be encouraging them to use backpacks and roller-boards.